Quite a bit has happened since my last July update, so here is quick recap of my summer adventures! Racing in Vancouver for BC Superweek was fun and successful for the team. It was the strongest field the series has seen with representation from multiple North American pro teams. My favourite victory of the week was at the Gastown Grand Prix. Huge crowds, a large prize purse and fierce competition made it a race to remember. Huge thanks to Global Relay for bringing back the historic race last year (this company is also doing awesome things by supporting young Canadian cyclists such as myself with their Bridge the Gap fund). I picked up a couple other wins at the Delta road race and UBC Grand Prix, and Denise soloed away from a break to win Giro di Burnaby. I was happy to see BC friends and to get my sushi fix all week. After Superweek, we took a fun road trip down the west coast to Oregon for the Cascade Cycling Classic. After a lung burner prologue, it was straight into the mountains. The race was not off to the best start, as we all suffered the first mountain stage. This changed our goals for the rest of the week to go for stage wins rather than the overall. We did pick up momentum as a team by the end of the week with Lauren winning the crit, Jade placing second out of a break on the final day, and I won the sprint jersey. The week finished off with a successful team World Bicycle Relief silent auction fundraiser held at a local brewery. Next up on the schedule was the Tour of Elk Grove near Chicago. This was an exciting race as usual between the sprinters and time trialists. The stages are relatively short with tons of time bonus sprints. This race was my first major NRC stage race win of my career back in 2011, and Jade won it almost exactly the same way last year on the final sprint. The team was a on a good path towards a triple victory. A strong lead out saw Joelle on the top podium step for Stage 2, which put the top three riders within 0.5 seconds on the final day. However, after a hectic final stage that included some ttt training to bring back a dangerous breakaway, Joelle took 2nd overall to Shelly Olds (Tibco) in the overall standings in a very close finish. After Elk Grove I had a good block of training back home focused on the upcoming World Championships Team time trial. In addition to riding, I’ve been trying to get back into building my core, and have added more yoga to stretch out after too much time in the time trial position. My latest race was the Fort Follies Grand Prix this past weekend in Fort Collins, Colorado. The crit was held just before the finish of the men’s stage 5 of the US Pro Challenge. Whitney Shultz of Colavita did an amazing job organizing the entire event in less than a month, I can’t even imagine how much work that was! Between myself, Lauren, Jade, Amber and Brie, we had a strong crit squad and wanted to race aggressively. A constant stream of primes and sprint laps meant constant race action. There were several moves that looked like they might stick, but it ultimately came down to a bunch sprint. We lined up as a team and executed one of our best lead-outs of the year, delivering Lauren for the win, while I held on for third. In addition to the win, Lauren received the sprint jersey, I won the Best Young Rider competition, and Brie was awarded the Most Aggressive jersey. The official launch of the Women’s Cycling Association was held that evening in town. Check out the website here to learn more and become a member: http://womenscyclingassociation.org/. Also be sure to check out the facebook and twitter pages for updates. It would be really cool for the US Pro Challenge to create a women’s stage race, or even crit series at the end of every stage of the tour. It would definitely provide some extra entertainment for the fans waiting to see the men finish. I’m now hanging out in France, ready to start Optum’s first Euro racing block! The team will race Ardeche, Toscana and the World championships team time trial. 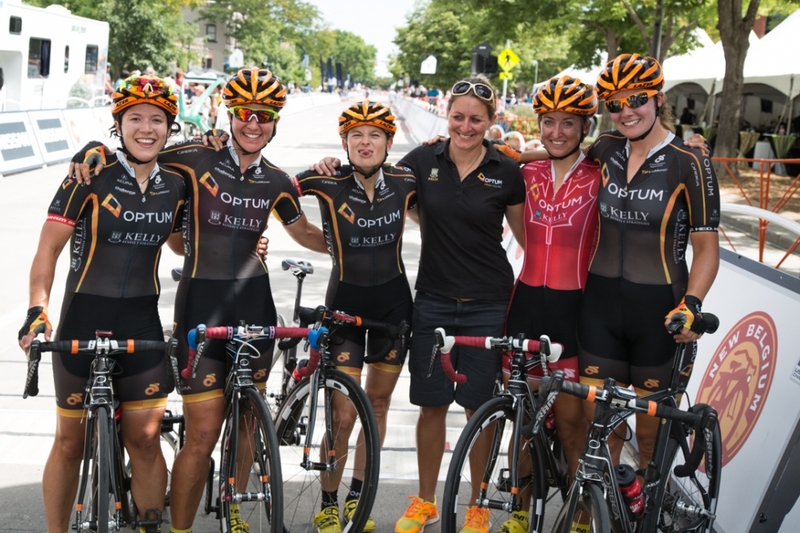 Many of us have raced in Europe with our respective national teams, however never wearing the Optum colours so it is a very exciting opportunity. Stay tuned for updates from Europe!